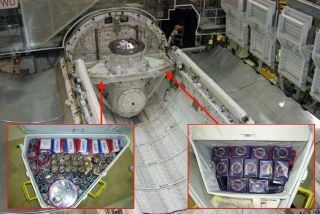 Mementos are packed to the right and left of Atlantis' airlock in modified tool stowage assemblies for the orbiter's final planned flight. Space shuttle Atlantis is marking its own final plannedflight by flying its flag. Thousands of the red, white, and blue"ATLANTIS" flags, miniatures of the type flown over the launch padeach time NASA's fourth orbiter has sat poised for liftoff, are packed inside amodified tool storage container located in the shuttle's payload bay. The 3,600 four-by-six-inch nylon flags (a subset of whichare for sister shuttles Discovery and Endeavour), togetherwith other memorabilia including 700 space shuttle-shaped lapel pinsand two almost two-foot-long rolls of gold foil, are stowed starboard, or tothe right, of Atlantis' airlock, opposite a similar triangular, trunk-sizecontainer packed with International Space Station (ISS) souvenirs. Both are forward of Atlantis' primary payload, the RussianMini-Research Module-1 (MRM-1). Setto lift off on Friday at 2:20 p.m. EDT (1820 GMT), the flight is slatedas Atlantis' 32nd and last mission. "Both [containers], one to either side [of theairlock], hold memorabilia, Official Flight Kit-type items," Robby Ashley,payload manager for Atlantis' STS-132 mission, said. The OfficialFlight Kit (OFK) is a milk crate-sized container flown on all spaceshuttle missions inside a locker located on the mid-deck of the crew cabin.Inside, NASA and the astronauts fly items for organizations that have supportedtheir mission's success. With Atlantis' interior OFK fully-packed with mementos forthe STS-132 mission, NASA desired additional room to fly commemorativesspecifically marking Atlantis' final flight. "They added [the additional container to the payloadbay] specifically for this when it was obvious there was going to be additionalweight capability for launch," said Ashley. Besides the flags, pins, and gold foil rolls, the exteriortool containers are also filled with 3,000 laminated bookmarks, 1,200 shuttleand 1,312 station program flags, hundreds of embroidered patches, and 16three-by-four-inch thin metal ingots to be used post-flight to mint coins. Like the items inside the more traditional mid-deck OFK, thesoon-to-be-space-flown souvenirs in the cargo bay will be left untouched duringthe mission to be distributed to employees and VIPs after Atlantis lands. Flying off into the "Dawn"
Packed inside Atlantis, as well as sewn to each of the six STS-132astronauts' pressure suits, are cloth patches that also commemorate the endto Atlantis' spaceflight career. "Having the shuttle - and Atlantis in particular -flying off into the sunset, I think is certainly appropriate," remarkedSTS-132 mission specialist Garrett Reisman, who led the patch's design for thecrew. "We really felt that, given this point in history, it was reallyimportant to recognize that." But there's a second, more subtle meaning to the emblem thatalso references a beginning. "Since the shuttle flies toward the east, we areactually flying into the sunrise," Reisman revealed, "and that sun isrising over our new module, 'Rassvet.'? Rassvet translated into English is "Dawn." "So, it is also the sun heralding the new research thatwill be performed inside this module." Reisman told collectSPACE.com that the insignia was theresult of a mini-design contest held among his friends and family. "We got back almost like a hundred differentsubmissions, it was really amazing," he said, adding the designs came fromall over the world. "Then our job was basically taking the hundreddifferent designs and then narrowing it down." "Several had that sun-peaking-over-the-horizon motif.We thought the symbolism of that was very appropriate. There were two that hadthe sun over the horizon and the shuttle flying off into it, and the finalpatch is a combination of the two," recounted Reisman. He identified the two "winning" design artists asa friend of his sister's in New Jersey and a former contractor to the KennedySpace Center in Florida who's designed several previous shuttle patches. In addition to the crew's patch, of which there are over 600aboard Atlantis,the OFK is flying the results of two other emblem design contests. All 85 ideas submitted late last year by NASA employees forthe space agency's commemorative patch marking the end of the space shuttleprogram are flying in digital form, saved to a CD. And the winning design in a children's contest to create aspace patch for the animated character Buzz Lightyear is also flying,continuing an educational partnership between Disney and NASA that earlier flewa 12-inch toy version of the "Toy Story" space ranger. Continuereading at collectSPACE.com for more details about Atlantis' onboardmementos, including the full manifest of the STS-132 mission's Official FlightKit.